The US added 64,389 full-time legal cannabis jobs in 2018. That outpaces growth in other sectors in the job market. Job openings in the cannabis industry have also surged. Forget the energy industry. Marijuana appears to be the fastest growing job sector in the US. The US added 64,389 full-time legal cannabis jobs in 2018, according to a new report from Leafly and Whitney Economics. That brought the total number of positions for the year to 211,000, a 44% rise from a year earlier. And that’s not counting jobs indirectly related to the marijuana industry, like lawyers, accountants, security consultants, media companies, and marketing firms. With those included, there were 296,000 payrolls in the sector last year. Jobs in the industry are expected to grow 110% between 2017 and 2020, outpacing what are often seen as the top sectors. For comparison, the BLS projects positions in solar panel installation and home healthcare will expand 105% and 47%, respectively, over the same period. Because marijuana is considered an illegal substance under federal law, the Bureau of Labor Statistics doesn’t report employment figures for the industry. The report authors used state data and industry figures to reach its estimates. While the marijuana industry faces significant legal uncertainty, it has made headway in recent years. Recreational marijuana is now legal in 10 states and Washington, DC. And across the US, there are other signs the industry is booming. 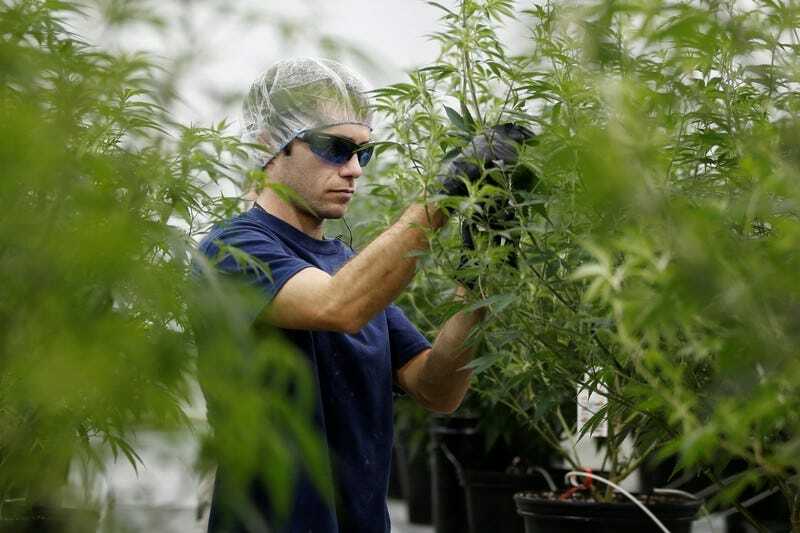 Job openings in the cannabis industry listed on the career site Glassdoor rose by more than three quarters last year, for example, jumping to 1,512 from 858 in 2017. “Investment in hiring is one of the strongest indicators for business confidence as it requires a substantial long-term investment of time, effort and money,” said Daniel Zhao, the author of the Glassdoor report. Overall hiring in the US slowed more than expected in February, with the economy adding the fewest jobs since 2017. Economists will be closely watching the next BLS report for signs of whether that was just month-to-month noise or the start of a downward trend. It’s unclear if the marijuana industry would be able to keep up the current level of growth in the face of a slowdown, said Josh Wright, the chief economist at iCIMS, a hiring software firm. “The cannabis industry sounds big enough to make a difference for a lot of individual workers and perhaps communities, but on its own, it’s not much of a recession-fighter,” Wright said.